Following up on our look at buildings moving across Army Street and the history of Clooney’s: On the left, the funkily angled Clooney’s, 2012. And on the right, 1938. “Wait a second,” you say. “The intersection is different.” Indeed! For it is a different intersection entirely — San Jose & 30th, not 25th & Valencia. Yes, it’s true — as we have all suspected, Clooney’s is capable of travelling through both SPACE AND TIME. Here’s the building comparison in GIF1938 neutrino format. You can all thank the esteemed Jonathan Lammers, architechælogist, who went on an historical building hunt using the 1938 aerial photo set scanned by the honorable David Rumsey. I am not exaggerating in saying that I found a good candidate for Clooney’s in less than thirty seconds: an odd-shaped building on the southwest corner of San Jose Avenue and 30th Street. It had two slanted bays facing north onto 30th Street, and three slanted bays fronting the diagonal line of San Jose Avenue. The location of the light well also seemed just right. 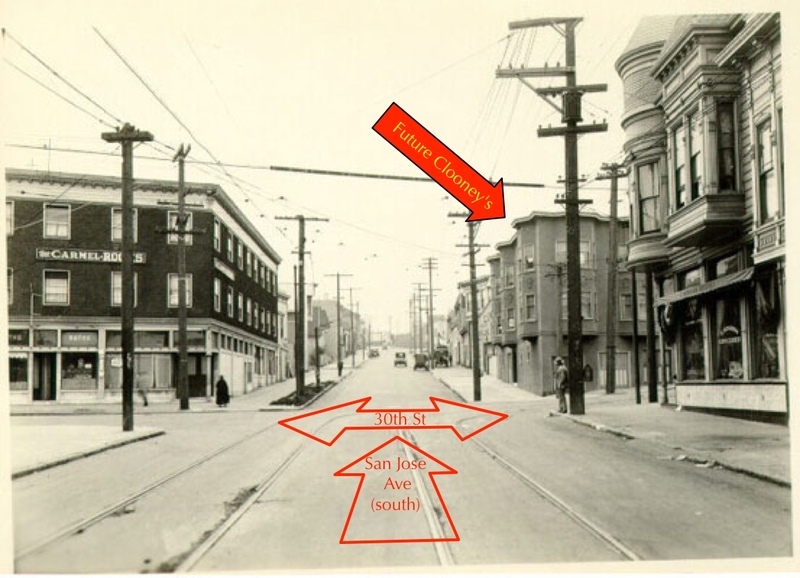 Feeling lucky, I decided to take a quick look at the SFPL historic photo collection to see if it might have an old photo of the intersection. Miraculously, it does. And there on the right hand side of the photo is what I feel certain is today the building housing Clooney’s at 1401 Valencia Street. Obviously, the first story of the building as it appears today is quite different. But it is not hard to extrapolate that when they moved the building onto a new foundation, they left a generous setback at the street so that they could construct a one-story extension for the pub. And why was it moved? Once again, street widening was the culprit. Comparisons of the 1938 aerial map and current views make it clear that many, many buildings were removed along the west side of San Jose Avenue. In fact, the current building standing on the southwest corner of San Jose and 30th was, in 1938, the third building west from the intersection! Almost certainly, the street widening was done in conjunction with the construction of I-280, which opened in the late 1950s. The fact that Urbane Libertine mentions that the electric meter at Clooney’s was installed in 1951 would appear to indicate that was the year the building was moved. The intersection of San Jose and 30th is almost completely unrecognizable compared to today. 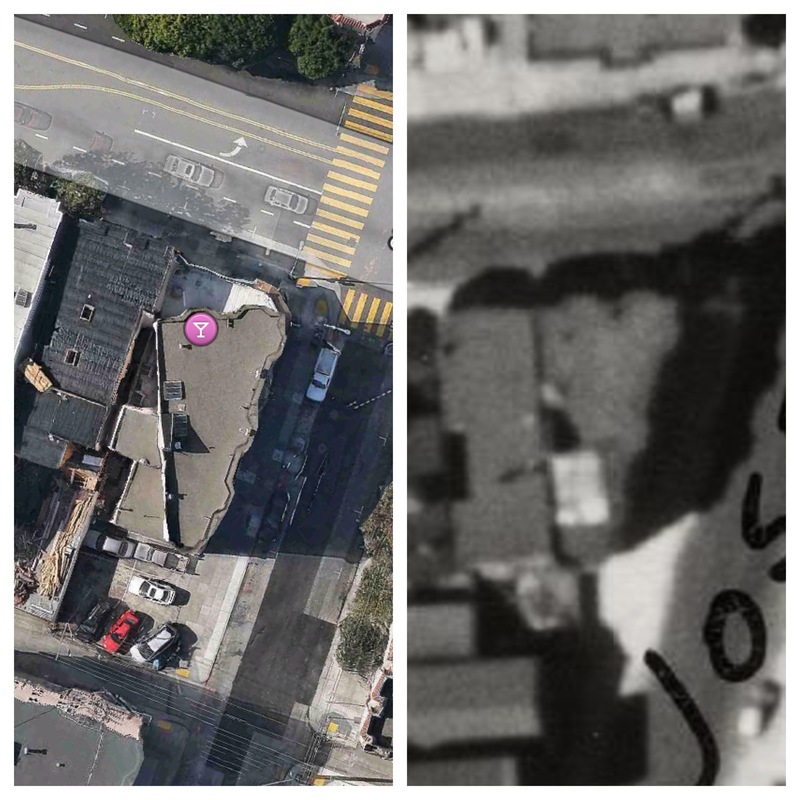 I wrote about this intersection over at Mission Mission last year and unbeknownst to me, I even marked the proto-Clooney’s apartment buildings at 800 San Jose Ave in my BurritoVision overlay! So be on the lookout for strangely shaped buildings throughout San Francisco — it may not be due to drunken architects like you thought. However, I have a hard time imagining an entire apartment building on the back of a truck. You can see “Hanson Bros House Moving” on the side of the truck. They were in the SF city directories in the 1930s through the 1950s (along with Pearson & Johnson and the Sullivans). Anyone have any idea how much it cost to move a house (or an apartment building for that matter)? Anyway, here’s to whoever decided it was worth moving 800 San Jose Ave to 1401 Valencia, if only because it gave us this Clooney’s story in the Noe Valley Voice. A few years back, while an EMT team was responding to an elderly neighbor’s needs, a fireman on sidewalk duty was taking stock of my Winfield Street home. I struck up a conversation with him and found my home was his grandmothers’ and he had spent a lot of time on my block as a kid. He told me that a few other houses on my block, including the elderly woman’s, were moved from the SF General Hospital site where many homes were moved to clear the site. He said many of those displaced homes ended up on Bernal, on the streets intersecting Cortland. He said they had a horse drawn capstain at the top of the Cortland Street grade that pulled the homes up the hill. You, Burrito Jurisprudent, are hereby challenged to dig into the records here. 352 and 356 Winfield are the alleged SF General emgirees. Surely a horse-drawn home hauling operation of this scale would leave photographic evidence in some dusty corner? In any event, the buildings today addressed as 352 and 356 Winfield are on both the 1900 (Vol. 5, Sheet 574) and 1913 Sanborn maps (Vol. 8, Sheet 775), so it’s extremely unlikely that they were moved. However, the 1900 map does not show the bay windows on the buildings, while the 1913 map does. It is possible that the bay windows were added during the early 1900s (this was a common remodeling project), but to me they look original. Just by their design, these houses appear to have been constructed circa 1875-1890. I and some other neighbors had noticed the Chapultapec name found in those Sanborn maps after they or links to them were published on this blog – thank you. As a result, when they renovated our brick street about a year ago, the original name was noted in a commemorative plaque in the sidewalk on the NE corner of Winfield and Cortland. 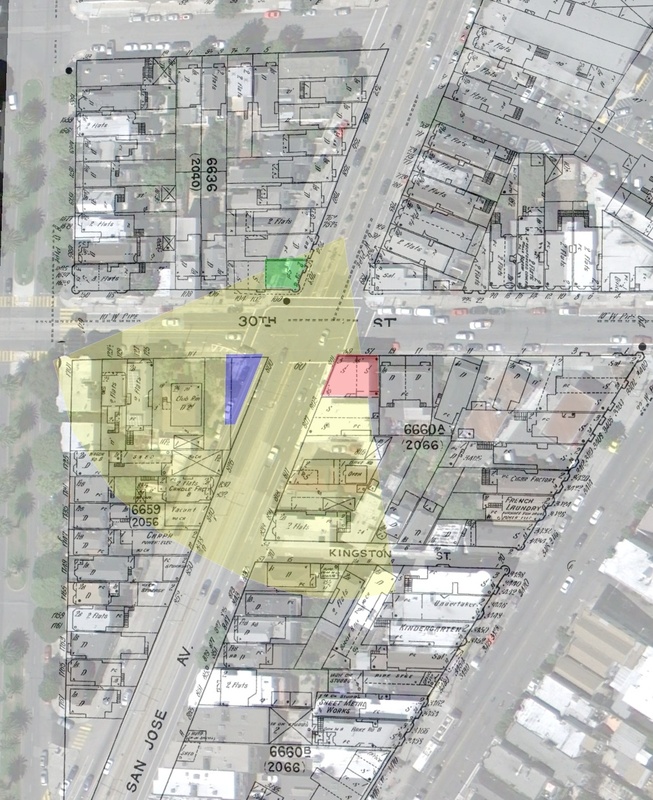 As for the history of those lots, the other piece of the puzzle would be the SF General history. Do we know when it was built? Or which dates corresponded to major expansion projects? It is possible, maybe probable, that the grandson / firefighter had gleaned some bits of neighborhood folklore — like hopefully the horse-drawn capstain house movers — correctly while getting other facts wrong. Grandparents have been known to exaggerate stories told to their grandkids! The brick buildings date from 1913 — they replaced a smaller two-story hospital built in 1872. From the 1905 Sanborns, it looks like the pre-1913 hospital was bigger than I thought. UPDATE: now with history encoded into GIF1938 format. Thanks! I was pretty happy with how they came out. Super cool! Supposedly the house I live in was moved from elsewhere as part of freeway construction, but I don’t know when/where from. My head pretty much exploded when I saw all of this research the other day, and the Burrito Vision helps me to put all the pieces back together! I had to go back and look through my files (while battling a death flu), because I had really believed that the building was moved in 1924, but now I’m not sure why I was hanging onto that, because this does seem to be the building I live in, sans medallions. !!!!! I’m now very intrigued by the exact orientation of the building, and when the “appendange” structure was built. The two buildings look sandwiched together on San Jose, but then proto-Clooney’s stands alone after being moved to 25th. When did the back stairwell get moved on; it almost looks like it was somehow on the (triangle point? I’m not an architectologist). From the inside, the hallways are contiguous so the remodel must have been pretty extensive – perhaps during the move. My theory is that the footprint for the saloon is the same as current, and now have several more rabbit holes to fall into. When I was but a wee lad, I remember watching a massive home, 3,800 SqFt, 3 stories tall, redwood structure, old victorian move into place a few blocks from where I grew up. It had to be transported over the bay, and was actually lifted from a barge by a giant crane. So yes, GIANT buildings can be moved great distances, but at a very high cost! The old-school movie of the move is priceless. Mr Justice – longtime fan, first time commenter. I work for the Presidio Trust here in SF an thought you might be interested to know that we are getting ready to move an ~8,000 sq/ft, 1897 warehouse to a temporary storage site in the next week or two. It’ll then be moved back to more-or-less it’s current location in a few years. There’s much more to the story than that, of course, but I thought I’d reach out to see if you were interested in checking it out when the time comes. Contact me if so – in the meantime, keep up the good work! I live at 756 San Jose. The house I live in was one of the sites where the house was picked up, and simply moved back. I have no backyard due to it! And I drink at Clooney’s fairly regularly, kinda cool.